Living with a missing tooth is a challenge! Eating the foods you normally enjoy can be difficult if you can’t chew properly. Smiling and talking in front of others may feel embarrassing. It’s even worse if you struggle with multiple missing teeth. The good news is that dental implants in Canton, MI can not only restore your smile; they can help you reclaim your normal life again! Boasting a success rate of 95%, dental implants are the best option for replacing one or more missing teeth, and this is because they replace both the tooth and the root. Your new root is a titanium post that is surgically placed into your bone, which creates a stable foundation for your new tooth. Your new tooth is a porcelain crown that is custom designed by your dentist to naturally complete your smile. Dental implants protect the integrity of both your root and your bone. The titanium post will keep your bone healthy and stimulated, while the crown will fill in the space and keep your remaining teeth from shifting. This is why dental implants are so successful and durable, in fact, with excellent home care and regular dental check ups, your implant can potentially last for a lifetime. Your dental implant will function just as your natural tooth did, so you’ll be able to bite, chew, brush, floss and best of all, smile! Implants are custom blended so they match your existing teeth, which means no one will ever know you were missing a tooth. The procedure is very safe and can often be completed in the comfort of your dentist’s office. 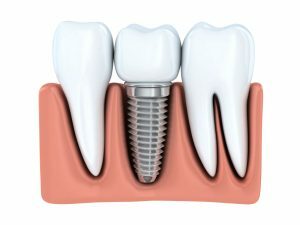 Dental implants can also be used to support a dental bridge or dentures for those who are missing multiple teeth. Implants are offering a more secure fit than ever before for denture wearers, while they can help prevent bone loss for those needing to replace adjacent multiple teeth with a dental bridge. At Robinson Dental Group, Dr. J.D. Robinson is proud to offer comprehensive implant treatment. He’s completed hundreds of hours of advanced training, which allows him to surgically place and restore dental implants. For you, this means you’ll be working with the doctor you know and trust for your implant care from start to finish, and the result will be a smile that you can be proud of once again! Contact our office today to learn more.